The statement also noted that the ministers welcomed the April and May inter-Korean summits at the border truce village of Panmunjom and the historic June Singapore summit between US President Donald Trump and North Korean leader Kim Jong-un. Contrary to the widespread expectations, the chairman's statement did not include the phrase, "complete, verifiable and irreversible denuclearization," apparently in reflection of Pyongyang's aversion to the term. 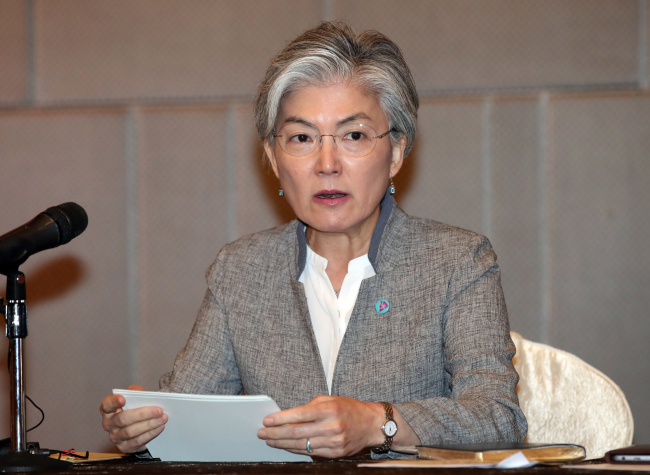 Regarding the absence of the CVID, Seoul's foreign ministry said that the ARF chair appears to have sought to couch its statement in "balanced" terms. "The chairman's statement came out after piecing together opinions of all 27 member states and trying to reflect them as much as it could," the ministry said in a press statement. "It is construed as part of efforts to use a balanced expression, considering the fact that the ARF is the only multilateral forum that the North participates in," the ministry added. The ministry also said that it has explained at the forum that it was "desirable" to use the phrase, complete denuclearization, as it was used in the April inter-Korean summit declaration and the June summit agreement between the US and the North. Meanwhile, the ministers at the ARF voiced concerns over land reclamations in the South China Sea, an apparent allusion to Beijing's construction of artificial islands capable of hosting military installations. "The ministers discussed the matters relating to the South China Sea and took note of some concerns on the land reclamations and activities in the area, which have eroded trust and confidence, increased tensions and may undermine peace, security and stability in the region," the statement said. "They reaffirmed the need to enhance mutual trust and confidence, exercise self-restraint in the conduct of activities and avoid actions that may further complicate the situation, and pursue peaceful resolution of disputes in accordance with international law," it added.